“Notes for Notes”, volunteer singers from the San Gabriel Valley Boys and Girls Club took to the stage to entertain the audience before the event to the delight of their families and friends. 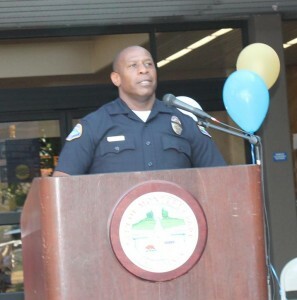 On August 2nd Officer Gary Sims welcomed the residents to Monterey Park’s “America’s Night Out Against Crime”, when neighborhoods throughout the city are invited to join forces with thousands of communities nationwide for the 33rd Annual National Night Out crime prevention event held in front of City Hall. 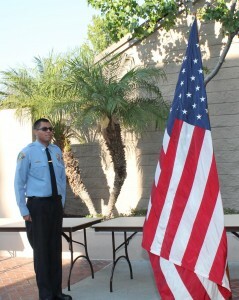 Police Explorer Raul Vasquez led our Pledge of Alliance. Kate Dy sang our National Anthem. The residents loudly clapped at the end of our song. 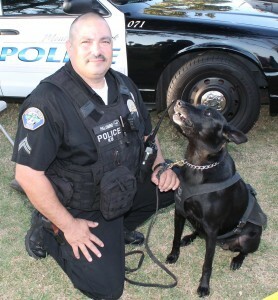 Please visit the police department booths that display our Special Response Team, K9 Unit, Community Relations Bureau, Animal Control and members of the Monterey Park Fire Department, Community Emergency Response Team (C.E.R.T.). 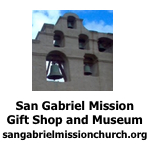 Please visit with our sponsors’ booths: The Boys and Girls Club, Project NEO, the Chamber, Alta Med and Farmers Insurance. National Night Out is designed to: increase crime prevention awareness; generate support for, and relationships in, local anti-crime efforts; strengthen neighborhood spirit and police-community partnerships; and send a message to criminals by letting them know that our neighborhoods are organized and fighting back. Tonight residents in neighborhoods throughout Monterey Park and across the nation are asked to lock their doors, turn on outside lights and spend the evening outside with neighbors and police. Police Chief Jim Smith said his department is proud to work with the community. We work together. The Council is supportive. 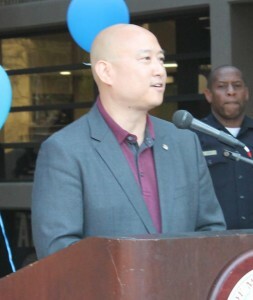 He introduced Councilmembers Hans Liang and Peter Chan and City Clerk Vince Chang. Mayor Mitch has a business meeting, Vice Mayor Teresa Real Sebastian is celebrating her anniversary and Councilmember Stephen Lam is out of town. They send their best wishes and support for this evening. 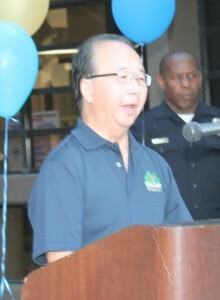 Councilmember Hans Liang said it is a pleasure to be here at NNO. It is an opportunity to meet your police and fire departments. Get to know your city employees. He thanked the residents for being here. He thanked City Manager Paul Talbot, Assistance City Manager Ron Bow and the staff for this event. Have a happy and safe evening! 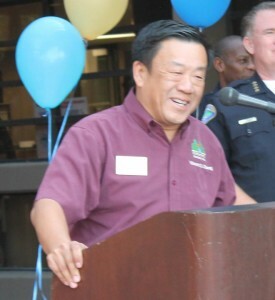 City Clerk Vince Chang greeted the residents. We need to have a partnership with our first responders. 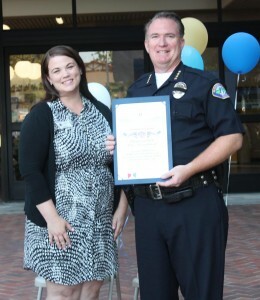 Katie Martel, Communication Deputy for Supervisor Hilda Solis, presented a proclamation to Chief Jim Smith in honor of this evening’s event. Supervisor Solis is very supportive of the community’s police and fire departments. Chief Smith introduced Trustee Mike Eng, City Manager Paul Talbot, Fire Chief Scott Haberle, Assistance City Manager Ron Bow, Department Heads: Dan Costley and Michael Huntley and Captain Gene Harris. He thanked the staff and residents for coming out tonight and being here. We are joined against crime. Enjoy! Congressmember Judy Chu said it is great to be here to keep the community safe. In these troubled times in our nation we need to get together with our neighbors. 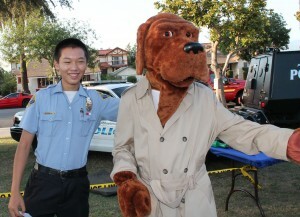 We have community policing in Monterey Park. People can assist the police. 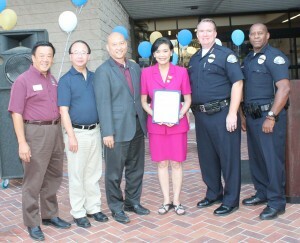 She presented a proclamation to Chief Jim Smith, Councilmembers Hans Liang and Peter Chan, City Clerk Vince Chang and Officer Gary Sims in honor of National Night Out. 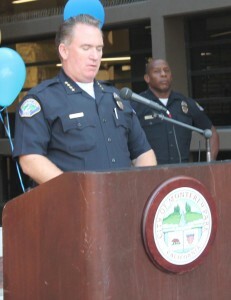 Chief Smith thanked Officer Gary Sims. Have a great evening! Officer Sims thanked all of the sponsors (Farmers Insurance, Project NEO, Boys and Girls Club, Monterey Park Police Officers Association, Monterey Park Fire Department, the Chamber and Alta Med) for their support. He also thanked Chief Jim Smith, Steve Coday and Danny Salazar for their support. Enjoy your evening! Please visit all of the sponsors’ booth and thank them for their support. 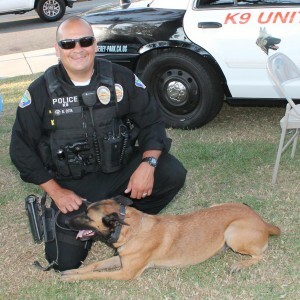 Agent Peter Palomino with his partner K9 officer Robin and Officer Raymond Cota with his partner K9 officer Veeda visited with the community. Sgt. 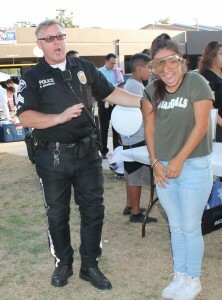 Brent Archibald had several students demonstrate walking while drunk using special goggles that distorted their vision. The students laughed at their antics. Sgt. Archibald stresses the dangers of driving or walking while impaired. Mc Gruff was on hand to visit with his friends and remind them to help him take a bite out of crime. 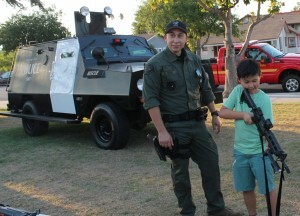 Children of all ages enjoyed viewing the SWAT team weapons. Some of them tried to handle the big guns with assistance from the team. Sparky joined the party and visited with his friends. Volunteers from Project NEO answered questions and served refreshments. 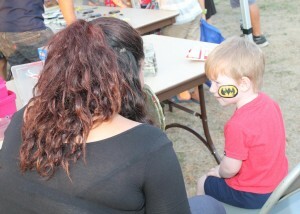 Jessica Ramos enjoyed painting the faces or arms of the younger crowd. 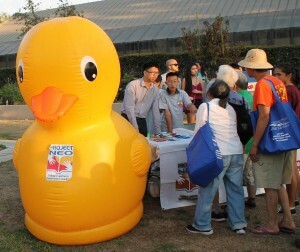 Monterey Park Police Officers Association had a booth. They also served refreshments and passed out safety information. 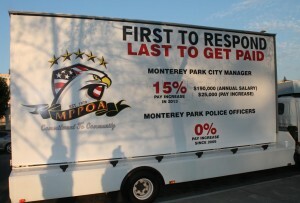 Their billboard asked the residents to support their efforts for a salary increase. 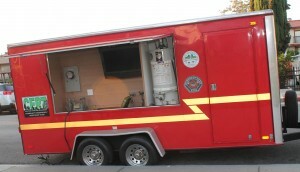 The famous CERT trailer was opened to teach the residents on how to safely turnoff their gas, electricity and water in event of an earthquake. 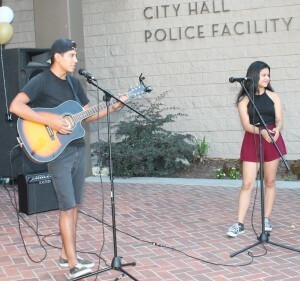 The front yard of City Hall was filled with residents checking out all of the booths and meeting their police officers, firefighters and neighbors.